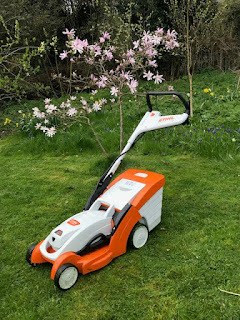 A couple of months ago I wrote a product review for the new Gtech Cordless Lawnmower. At the time of writing I had two unfinished thoughts that I mentioned. I mentioned that having two batteries would be my natural preference as to cut all my lawns I needed more than forty minutes worth of power. The very nice people at Gtech sent me a spare battery, which was kind of them and I am very grateful. I am now a two flux-capacitor household! Having two batteries has made the lawnmower an even better experience to use. I am also going to suggest after using the mower now since June, that I think the batteries sort of mature. They seem to last longer after a couple of charges. Before you all fall about laughing and say that such a thing is not possible, I suppose I might just be getting better as using the mower effectively - either way I think it charges better after a couple of goes. 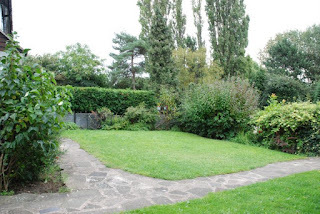 The big question I had in the blog was how would the mower manage with the big mow in September when I mow the Wild Garden. Well, the big mow is now complete. The Wild Garden makes up about a third of the garden. I allow the grass to grow and I mow paths through it. This year I planted some yellow rattle in it to weaken the grass and this has meant it was not quite as tall as usual. There are also some perennial geraniums, nettles, thistles and other wildflowers/weeds that provide a great place for wildlife. Before I can mow this area I have to scythe down the tall weeds/nettles; then I can give it a mow. It is quite a challenge for any lawnmower. The Gtech, as previously observed in my review, can be a bit sensitive to grass height so I wondered if it would cope. I set it at its tallest cutting height as that it what I have to do with my other electric mower. It coped, it coped well. It did take a battery and three quarters to do it but I was very pleased with the result. The next step is I will mow it all again next week on a lower cutting blade. I only mow the whole garden two or three times a year and I think the two batteries will be needed both times. I am really pleased with how the mower has worked and the recommendation I made before is confirmed. I hope your flux-capacitors will have a happy life together! I am impressed by both the mower and your restraint in mowing only 2-3 times a year - I twitch if the grass gets too long, but then my garden is small and it looks wrong. I fancy a cordless. Thanks for the review. I need to ask you: why do you only mow 3 times per year? Hi - in the Wild Garden I let the grass grow and just cut paths through it. It makes a sort of wild meadow affect. This has three benefits- the wildlife love it, I think it looks good and makes good contrast to the more formal parts of the garden and it reduces the amount of mowing I have to do regularly by about a third.